Six Senses Ninh Van Bay launches Earth Lab as part of Six Senses Hotels Resorts Spas global commitment to sustainability. 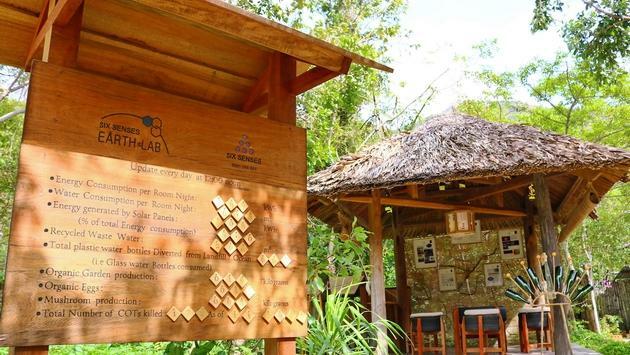 Earth Lab is a place that showcases the resort’s sustainability efforts in reducing consumption, produce locally and support communities and ecosystems. Guests are invited to join tours of the organic gardens, mushroom hut, water treatment plant and solar panels. In addition, guests at Six Senses Ninh Van Bay can visit the organic chicken farm and learn about making natural essential oils at the alembic using the ingredients grown on site.Earth Lab also displays scientific, yet practical facts and figures, raising awareness and sharing information to persuade people to modify their daily behavior and incorporate more sustainable practices. — One of the largest organic gardens within the Six Senses group which is spread over 215,278 square feet that grows more than 40 different types of herbs, fruits, and vegetables. — Alembic – a facility that produces essential oils from kumquats, eucalyptus, and lemongrass grown at the organic garden as well as orange peels discarded from the kitchen. The peels, which are hard to compost due to the high content of oil that prevents decomposition, are collected and the oil is extracted in the alembic. — Chicken farm with 120 free-range chickens producing 30 to 40 organic eggs daily for guests to collect and enjoy at breakfast. An incubation facility is available to hatch baby chicks. — Do-it-yourself compost and chemical-free detergent that guests can learn how to make with the assistance of the resort’s sustainability supervisor. — Water treatment plant that engages an energy-free and chemical-free system to remove the iron content from water collected at a nearby reservoir to use for running water. — Reverse-osmosis plant for bottling the resort’s own water using glass bottles to eliminate the need for single-use plastic bottles. This saves around 15,000 plastic bottles per month from polluting the landfill and being abandoned in other areas. — Mushroom hut produces about 88 pounds of fresh mushrooms each month. — Coral Reef Restoration Program: The resort is committed to launching a coral reef restoration program to protect and preserve the surrounding pristine and fragile marine ecosystem. The coral project takes place in various stages and the resort is in collaboration with the Oceanography Institute of Nha Trang. The main objective at this current stage is to establish swimming/snorkeling pathway through the reef, create an inventory of the marine life and protect the reef from further damage. The program also aims to eradicate the Crown of Thorns (COT) starfish which preys upon coral polyps and eventually kills the healthy coral. The resort’s team of marine biologists uses a mixture of lime juice and vinegar to kill the COT starfish and stop it from spreading while avoiding the use of chemical solutions. — The resort is privileged to have the black-shanked douc langur (Pygathrix nigripes), an endangered monkey-family species that is protected in the habitat surrounding the resort. The resort educates guests about langurs and ensures that when hiking or interacting with the langurs that guests do not to disturb them or give them food. — Children also have a chance to get involved with the sustainability projects through a number of activities in the Grow With Six Senses program, such as being a farmer, the alembic, and the chicken farm tour. There are also experiences for teenagers at Earth Lab such as the recycle factory and trivia competition, where teens can test their own knowledge about the earth matters. Six Senses Ninh Van Bay is committed to building and maintaining positive relationships with the local communities and providing support in a number of areas. The resort is proud to have a strong relationship with schools in Luong Son and Ninh Van areas and has assisted in a number of projects to help develop the schools, such as improving the drinking water systems and providing computers so that the teachers and students have a more effective way of teaching and learning. The resort also supports Nha Trang University students on their three-to-four-day charitable trips to remote communities to provide life-skills lessons and basic facilities such as street lights, organic gardens, playgrounds for children and more. This activity not only supports ethnic groups but also helps to encourage students in doing good things and improve their organizational skills. The Earth Lab logo has a rich story behind its design. The hexagons represent nature’s beehive pattern that represents Earth Lab’s commitment to producing natural products. The design also evokes feelings of scientific discovery, which we aim to inspire in our hosts, guests, and community members through educational programming.